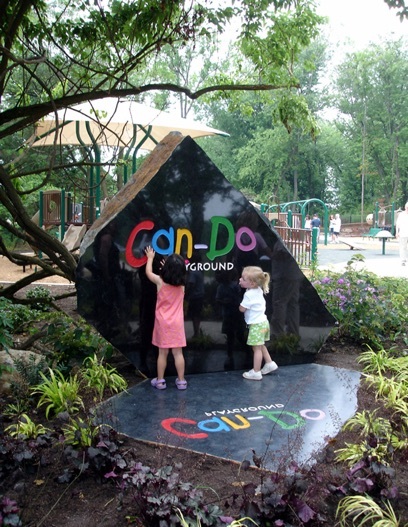 The playful sculpture that greets visitors to the Can-Do Playground was created from a 9.5-ton boulder of Brandywine Granite. Rick found the huge stone on surrounding park grounds and cut the it in two “as if a giant came along and split it, leaving the two halves where they fell. It is a statement that this gem of a playground is found within the park, like crystals within a geode.” A Boundless Playground, Can-Do allows children of all abilities to share the creative experience of playing. The mirror image represents the fact that there are other ways to see the world.